Not a lot has been happening, really, but I thought I’d have a little blurt on the blog. I have finally managed to plant the tulips – found a huge pot which took all 14 of them. They’re apricot and I can’t wait for them to grow. I’ve wanted to plant apricot tulips for a long time, but there’s just no space in the garden beds! The garden is actually lovely at the moment, the rudbeckias are really cheerful, and I’ve managed to plant the daffodil bulbs as well as some – lots and lots – of annual poppies too. Fingers crossed they grow. Last thing I’m going to plant are winter pansies. Dark purple ones look wonderful on the front of the house as it’s cream-coloured. Just need to pop to the garden centre and buy some. I have everything else I need to plant them. The pain in my hand is still there. Not all the time, but when I try to straighten my hand out, to pick up a glass of water, say, or something like that, I can feel it grinding and it cracks very painfully. But I’ve seen the doctor, told her I’m no longer on the Tramadol, and she’s prescribed Co-codamol. That’s ok and helps with the pain, but makes me very sleepy, so I’m only taking them at lunchtime and bedtime, or else I’m asleep all day long. Knitting is going well. Have finished two Christmas presents, am on a third, and plans for more. Each project takes a week or two, and I’m not planning to knit as many presents this year, so I won’t feel I’ve failed if I don’t get round to them for whatever reason. Is it just me, or do we all (women) set ourselves impossible targets then beat ourselves up when we don’t achieve them? 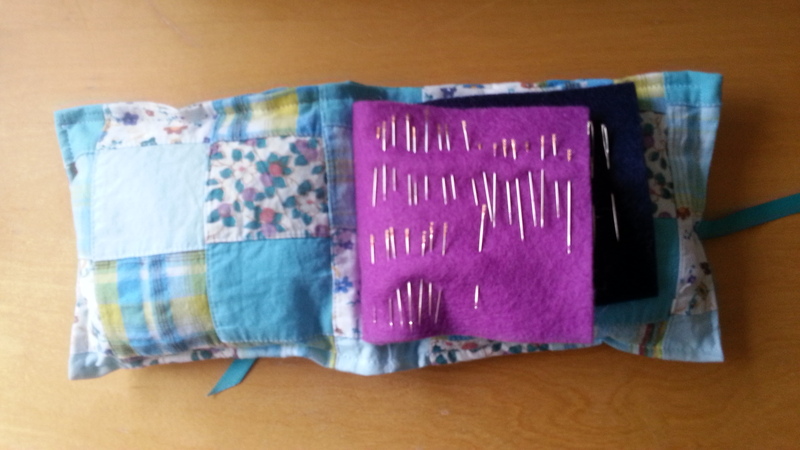 Made a new sewing needle case today. The old one was very old and boring and falling apart, so I found a scrap of fabric and made myself a pretty new one. 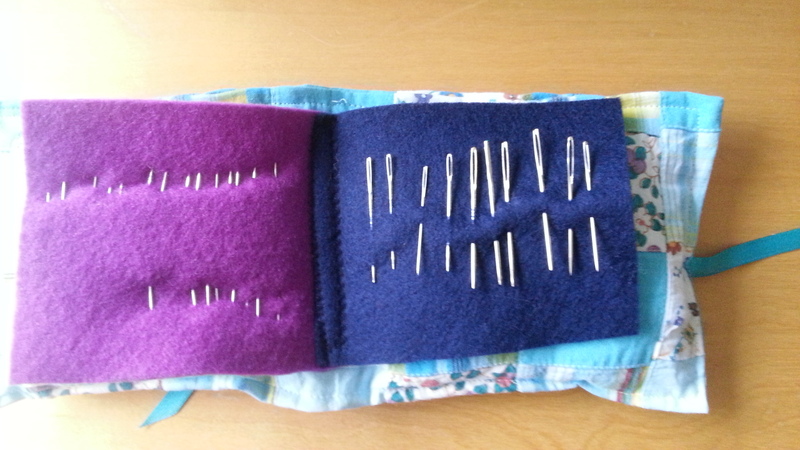 Also set up another Christmas present – a sewing project this time. All ready to go now, but enough is enough for one day. We have fixed the kitchen sinks and taps this week. The sinks have “basket waste strainers” or some such technical term, and although the washers are detachable, you can’t get the replacements. So we went to B&Q and found something that will do, and instead of buying new “basket waste strainers” for £12.50 each, we spent £2.50 on two new washers that will fit. The taps needed new “insides” – don’t know the technical term for that – you can’t get just washers for the sort of taps we have – but we fitted those ourselves and they’re wonderful now. It’s like having a new sink! I’m about halfway through Christmas presents. Some are hand-made, some I’m buying, but I don’t have plans for all of them. Need to check Amazon wish-lists (yes, mine is all up to date) and contact parents. Children’s wish lists are a false friend – they don’t update them, so you end up buying them something you think they’ll love, and they already have it. Yes, it’s happened to me. The cat has completely recovered from her abscess under the eye and the fur has all grown back. You’d never know she’d had anything wrong with her. Bless her little heart. I’ve been reading a lot of Bill Bryson books lately. They always cheer me up, no matter how dreadful I’m feeling, and I frequently laugh out loud. As a result, I have been thinking about what would constitute a perfect small town for me, and mostly it’s where I live, although I would be very happy to do without the McDonalds. There are bookshops, several libraries, a local yarn shop (7 minutes walk for me, yay!) a pleasant shopping area, but a few too many chain stores. More independents would be nice. But hey, you can’t have everything. I always go to an independent shop whenever I can – Woolmans rather than Notcutts, Stitch Solihull rather than anywhere on line or Hobbycraft, and so on. Can’t wait to cast on part 2 of my current knitting project tonight. Always exciting. And the yarn is fabulous – Opal Sweet and Spicy – you just never know what’s going to come up next colour-wise! Update on This and That. Fetched car from the garage today. It’s 14 years old now, and needed some welding done to it. But I love it, it’s just perfect for me. It’s an old Ford Ka, in very dark purple. The alarm system has finally been fixed, with a further visit (this was the third) from the alarm company. Finally managed to sort out a keyboard for our Tivo box – it’s an Apple app called Peanut Plus (why?). It replicates the remote control configuration and provides a proper QWERTY keyboard. For £1.50. Excellent. So the £12 wireless keyboard which didn’t work has gone back. Result, I’d say. Had a brief but rewarding conversation with The Husband about the socks I was knitting him. He wasn’t that keen and I was hating knitting a boring rib in a boring colour. So that project has hit the dust and has been unravelled. I’ve started another project, for a Christmas present, so no photos yet. But it’s in a fabulous colour, called Sunset on the Horizon and has cheered me up no end. However, I’m in the middle of a small M.E. crash, which isn’t good. I’m sleeping until lunchtime and then slobbing around all afternoon. Hm. It’ll pass, when I’ve had enough rest. The Christmas sewing project went so well I’ve extended it a bit, and bought some more fat quarters. But now have no energy to actually do anything with them. Yet. Still haven’t been able to plant any bulbs yet – maybe next week. We had our alarm system serviced on Wednesday morning. Wednesday afternoon it went off, all by itself. The man came back and sorted it out. Or so we thought. This morning it went off again, at 6 am. It wasn’t set, hubby was awake and out for a walk. I dragged myself out of bed, down the stairs, and put in the code, and it stopped. Harrumph. So they are coming out again with a special “thing” to stop it doing that on Monday. Fingers crossed for the next three nights . . .
Today my car has gone to the garage for a service and MoT test. I take it to Westley Garage, on Station Road, in Acocks Green, and have done for several years, on the recommendation of a friend. They’re good, trustworthy, friendly, and know me by name. The only thing that’s complicated about it is that this garage was my Dad’s. Walking up the forecourt, going into the office, all of it, brings back childhood memories, not all (or even many) of which are happy. In fact, today I got quite tearful as hubby drove me home in his car. The staff working for my Dad were lovely, kind and funny and nice to my sister and to me. Just the smell of the cars being fixed brings it all back. The guy in charge now remembers when my Dad used to run it. Mm. Knitting – going well. Have finished Antarktis and am absolutely delighted with it. May well knit another one in the Sweet Georgia Cashluxe turquoise I have. Currently knitting a sock as an experiment for hubby. He wanted plain brown or black, but I just said no, that’s too boring to knit. It’s grey-blue and self-striping, very muted and sombre. If he likes this sock, I will knit him the pair, but am not knitting two socks before he tells me he doesn’t like them. I’ve also bought some Sirdar Chunky yarn to knit him another slipover top. Also fancy knitting another Pimpelliese shawlette. Sewing – Christmas project all finished now. I am pleased with it. 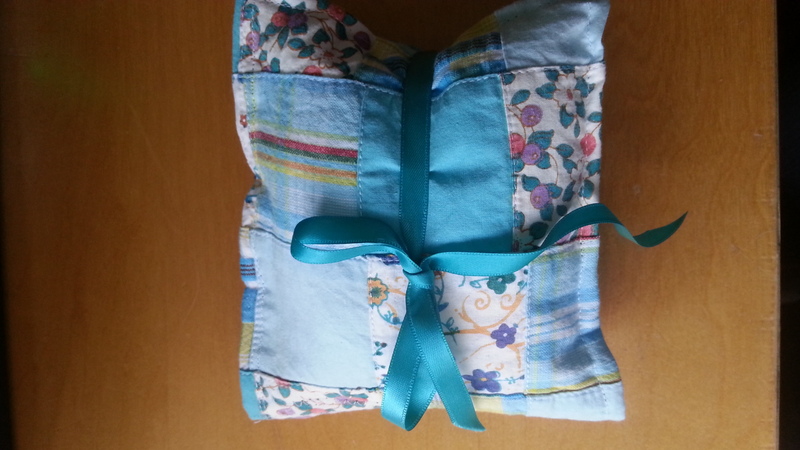 I don’t sew clothes, just curtains, cushion covers, and oblong or square things. 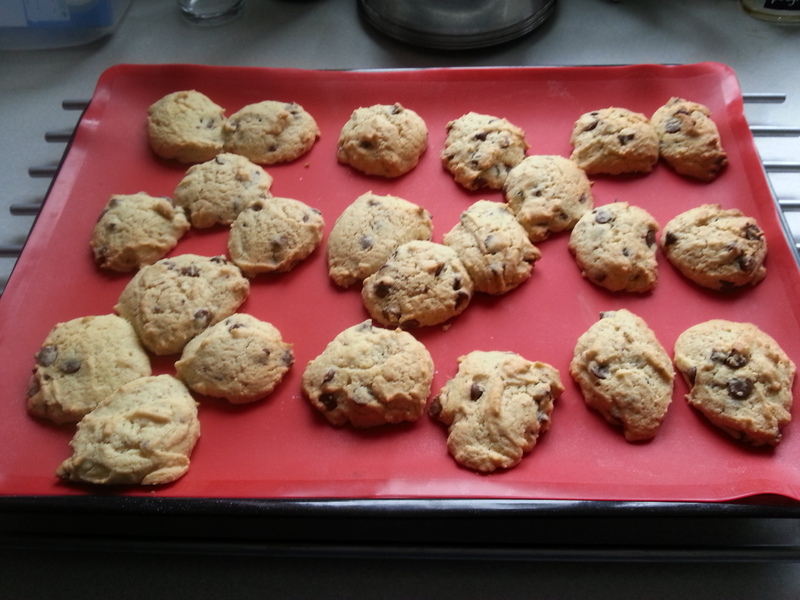 This morning I’ve baked some chocolate chip cookies (dairy free of course). Hubby is off to do some leafletting – about keeping our NHS public. Gardening – I’ve dug up all the aquilegias from one of the beds. I do love them, but they’d gone absolutely bonkers and were trying to take over the world. They’re a pain to dig up, though, they have long tap roots just like dandelions. Now there’s room to plant some daffodils, and when those are in, I have some annual poppy seeds to sprinkle on top. There’s a lovely red ornamental grass with lovely fluffy-looking seed heads which is going in a pot, and I have two pots ready for some miniature daffodils, which, when they start to sprout, can go each side of the front door. 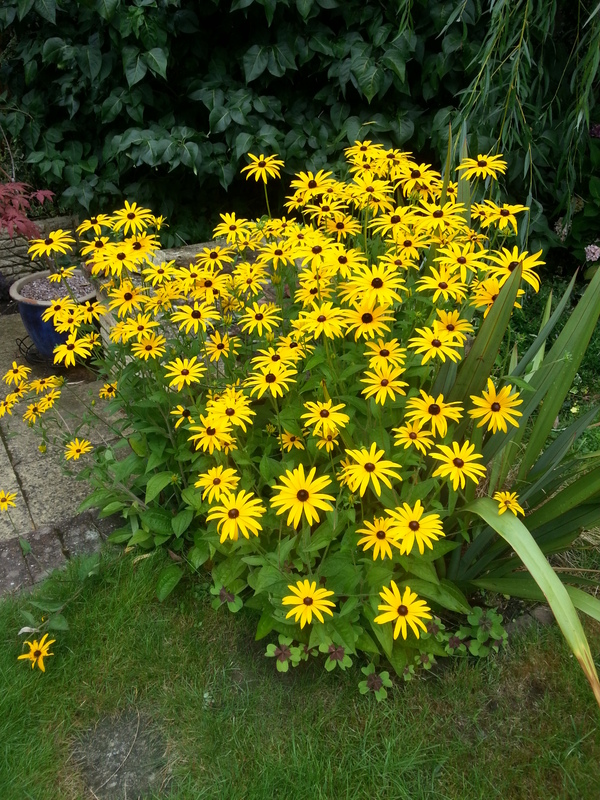 The rudbeckias are lovely. I used to think they were gaudy and horrible, but they really, really cheer up an autumn garden. I also pruned two of the buddleias really hard back, and the wisteria which, despite being cut back to its trunk, is going wild again. There’s another buddleia in the front garden which is going to get the treatment next time I’m outside with a pair of freshly cleaned and WD40’d secateurs. And it’s not actually raining. 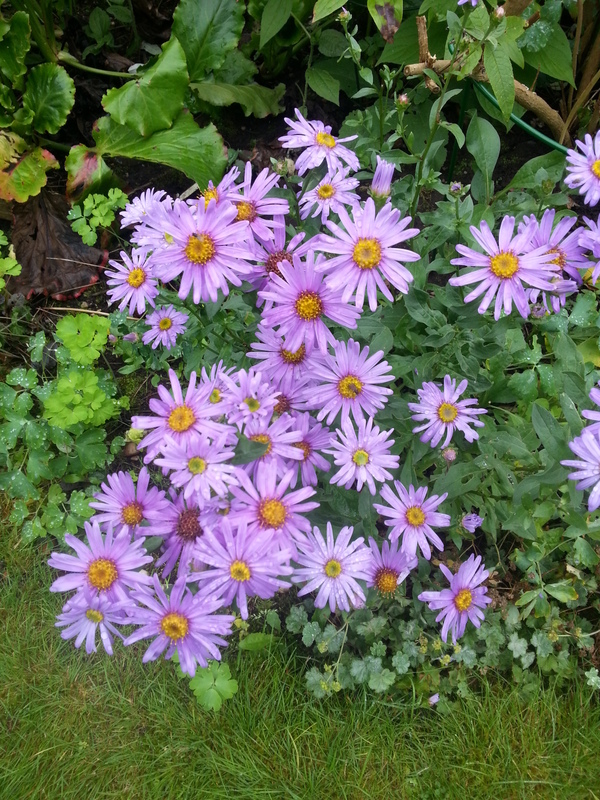 Love these Michaelmas Daisies too. 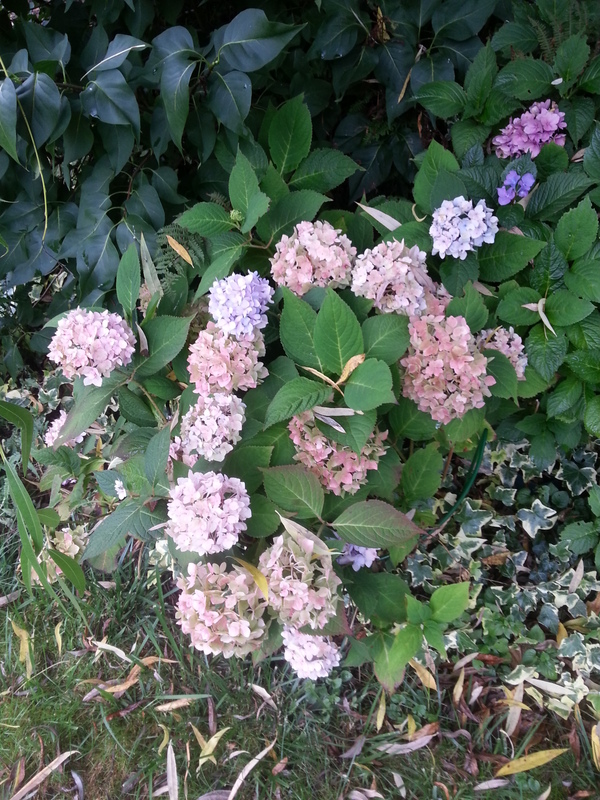 There are two hydrangeas here, but one of them has flowers in both blue and pink. Love it. 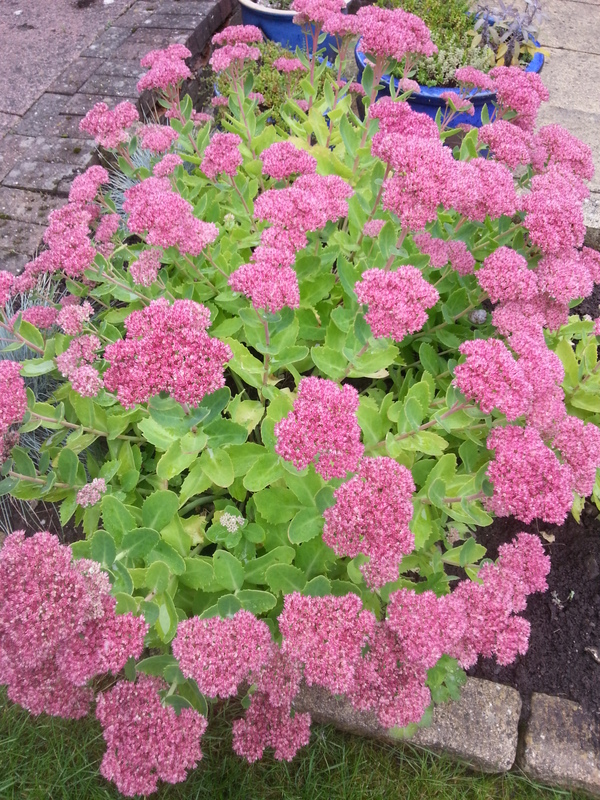 And love these sedums too. Just booked the train for a weekend in mid-November to go and stay with ED and her chappie. Can’t wait. They’ve decorated their lounge this year and I really want to see it, and them of course, and their crazy cat JR. I’ll take knitting to do on the train, but can’t knit in their house because JR just can’t cope with it. “what’re you doing? what’s that? why is that stringy stuff wriggling about? what are those sticks doing? can I play?” No. Just no. and feeling much better about it. I was dreading picking up Glam Shells, but am looking forward to this one. I started it about half an hour ago and am already getting into the rhythm.